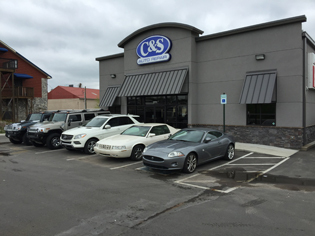 C & S Auto Repair Offers Auto Repair Services You Can Count On! Since 1978, C & S Auto Repair has provided motorists in the Clarksville, TN 37040 area with comprehensive auto repair services that include Brakes, Car & Truck Care, Domestic Cars & Trucks, Electrical Services, Electronic Services, Engine & Transmission, Engine Maintenance, Fleet Brakes, Fleet Drive Train, Fleet Electrical, Fleet Electronics, Fleet Engine Work, Fleet Front End Services, Fleet General Services, Fleet Suspension Work, General Services, Heating and Cooling Services, Import Cars & Trucks, Miscellaneous Services, Quick Lube Services, Towing, Transmission Services and Undercar Services. Our goal is to offer the best services available at affordable prices to get you back on the road in no time. For a high-performing vehicle, trust C & S Auto Repair with your car, truck, or van. To learn more about the services we offer, please contact us by phone at 931-552-2575 or send us an email. We also invite you to learn more about our dedication to you, our valued customer. These guys really know what they're doing and they are very personable. Brought my Dodge Charger in to get the oil changed because it was running rough, and they had the problem identified and fixed in minutes (the last shop I went to used the wrong filter). Honestly this is the only shop I like to bring my cars to - never had a bad experience and they shoot you straight. I've been using C&S Auto for quite a while now. I've never found a more honest professional, courteous business. I'll never bring any of my vehicles anywhere else! Doyle and his team got me in quickly and made the repair in less time and for a Lot less than I?d been quoted previously. My husband brought his truck here a while back and was very pleased so and when my window regulator quit suddenly I started to call around- after one phone call and a ridiculous quote, I saw C&S listed and immediately thought ?oh right! C&S!? Needless to say, next time they?ll be my First and only call, but in hindsight, I knew what a value I was getting based off the other shops quote. Thanks again!! Excellent in every regard! Diagnosis, repair and value. I appreciate the work Doyle took care of for me today. Honest and very accommodating and did great work. C & S will be my go to shop for auto repair in the future. I highly recommend them! I have been so impressed with C&S?s professionalism, timeliness, and service. Doyle always does a phenomenal job communicating the status of our vehicles with us, and the estimates and costs for repairs are always very competitive and fair. We will continue taking our vehicles here. I highly recommend C&S . C & S is the best of the best! They are helpful and very honest about what needs to be done to your vehicle, not jacking up the price. My daughter-in-law researched them because I needed someone I could rely on in their family's absence. The work they have done for me has been good and quick. Just recently brought my 2008 Volvo XC70 in for repairs. The customer service was great, called with detailed description of what was wrong with our car. They had it fixed and ready to go in no time. Greatly appreciate their honesty and abilities. Highly recommend, cost and repairs were top notch. Doyle and team are excellent. Highly recommend to anyone needing vehicle servicing! The service here is phenomenal. I dropped my vehicle off when the business opened and within 2 hours I knew what the issue was and the price to fix it. 2 hours later my vehicle was ready to go. The employees are both courteous and professional. I would recommend anyone here for quick, courteous, and reasonably priced service.